Patch 1.13 has been released for NBA Live 19. It will be downloaded automatically as long as your PlayStation 4 or Xbox One is online, but if you encounter any difficulties, try restarting your console or checking for the update manually. A full breakdown of the new player likeness updates, roster moves, and additions to The One Store can be found here over on Reddit. 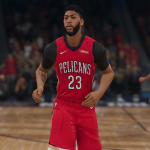 I’ve also updated our own patch history for NBA Live 19 in our Wiki. As always, feel free to share any thoughts in the comments below, as well as join in the discussion here in the NBA Live 19 section of the NLSC Forum.